You have nearly three weeks to do this. Don’t miss out. You know the story by now, my favorite Christmas story ever. If you know it, treat yourself and read it again. If you don’t know it, if you’re new here and you have no idea what I’m talking about, go click the link and find out. You won’t regret it. Merry Christmas, everyone. If you have had a picture taken with Santa Claus in San Antonio this holiday season, there’s a good chance he was booked through a local business run by a head elf. That head elf is Renee Davis, CEO of San Antonio-based Santa Express Central, who manages more than 50 professional Santa Clauses across the state, a business Davis said keeps her busy year-round. “In order to get a really professional Santa, retailers get on it a good 18 months to a year in advance, because it’s that competitive to get a good Santa,” she said. All of the Santas with Santa Express Central have real beards, Davis said. She puts them through a background check, insures them, outfits them with Santa uniforms, and enrolls them into her own Santa school. There they practice their ho-ho-ho’s and learn how to style themselves properly, speak around children, preserve the magic of Santa Claus, and strike the best poses for the camera. Her training prepares them to be the best Santas they can be, she said. Between November and December, Davis estimates she books more than 600 events with her Santa Clauses. She has 57 Santas across Texas, though the majority live in the San Antonio and Hill Country area. Hey, Santa has better things to do than figure out where his next gig is. It’s good that he has someone to do this sort of thing for him. Visit the charmingly retro Santa Express Central webpage to learn more. Every year on Christmas Day, I link to my favorite Christmas story, which stars Mel Torme. This has been a rough year in many ways, but reading that story always makes me happy, and I hope it will do the same for you. Merry Christmas! Not to mix metaphors, but may your days be merry and all that. Every year on Christmas Day, I link to my favorite Christmas story, which stars Mel Torme. 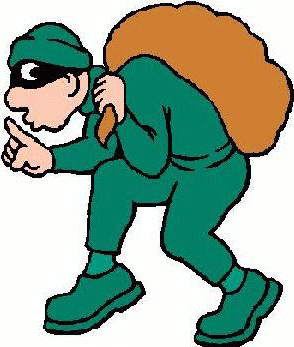 It is often shamelessly ripped off a lot, which is a Bad Thing that one Should Not Do. So click over and read it, and may your heart grow three sizes today. Merry Christmas to you and yours from me and mine. Every year I watch this, and every year it makes me happy. I’m especially happy that they made it while Don LaFontaine was still with us. May Santa be good to you and yours this Christmas Eve. There are of course more traditionalist versions of this, but I’ll leave them for you to discover. I’ll have a couple of things to post over the next few days, but it will be pretty light. Have a happy weekend and a very merry Christmas. For two months of the year, Houston aircraft mechanic Lance McLean trades in his coveralls at the end of the day for a red Santa suit. This year, McLean will don the suit 49 times, beginning Saturday. Twenty-nine of those events will be held at Houston public libraries. Internet research led to Lone Star Santas, a local nonprofit based in Cypress. The group includes some 350 Santa Clauses, Mrs. Clauses and elves who work throughout Texas. Members network, socialize and organize special events for disaster-stricken areas. I’ve written about the Lone Star Santas before. They’re a cool group, even if their website hasn’t had a style update since their founding in 2007. As it happens, I have a coworker now who does Santa stuff on the side. This is a busy time of year for him, as you might guess. I don’t really have any point to make here, I just figured we could use a little Santa right about now. This was recorded in 2002. Seeing Clarence Clemons and Danny Federici again – it’s all the feels, you know? See what I mean? Makes it easy to bring the song in at around three minutes, that’s for sure. Yes, I know, they’re all hipstery and precious, but I like their rendition of this song. If it were another “Jingle Bell Rock” or (God forbid) “The Little Drummer Boy”, I’d feel distinctly less jolly. This one is OK with me. And before anyone asks, the Christmas-in-summer theme is well established, especially if you grew up in New York in the 70s and 80s. Always a pleasure to hear. Pancho Claus [Richard Reyes] works year-round, looking for sponsorships and running an ongoing toy drive, so he can have enough to hand out each December. His day job involves driving a promotional vehicle for Taxis Fiesta, a local company that sports the colors of the Mexican flag on its fleet of cabs. Reyes says he tries to look out for the underdogs. It’s something his mother instilled in him while he was growing up in Houston. Help out, give back. Now, at 64 and with a slew of health problems, it might seem a good time for Reyes to hang up his sunglasses and put away the suit. But he doesn’t think so. I blog about Pancho Claus every time I see a story about him. The man himself suffered a heart attack six years ago, but it clearly hasn’t slowed him down. We should all be as full of the Christmas spirit as Pancho Claus. Feliz Navidad, y’all. I’m nowhere close to being tired of this, so look for it again next year. Happy Christmas Eve! I figure today is like Friday for most people – I will certainly be on a reduced schedule for the next few days – so here’s an early song list, in honor of our benighted Ag Commissioner, Sid Miller – ten seasonal songs that do not mention the word “Christmas”. See here and here for some other songs in this category. May your days be merry and bright, and may anyone who wants to slap you for not saying their approved holiday greeting be visited by ghosts until they learn the true meaning of the season. Every year on Christmas Day, I link to my favorite Christmas story, which stars Mel Torme (a more recent posting of it is here). Apparently, this story is so popular now that it gets ripped off a lot, which sure seems to be contrary to the Christmas spirit if you ask me. But let’s not worry about such things this morning. Merry Christmas to you and yours. May your days be merry and bright, and may the new year bring you all the joy you can handle. And now I’ve got to dash away as well. Merry Christmas to all, and I’ll see you on the flip side. Now this is what I call going old school for Christmas. Long before parents relied on the powers of Santa Claus to monitor their children’s behavior, their counterparts in Alpine villages called on a shaggy-furred, horned creature with a fistful of bound twigs to send the message that they had better watch out. Tom Bierbaumer recalls the trepidation he felt every Dec. 6, when the clanging of oversize cowbells signaled the arrival of the Krampus, a devilish mountain goblin who serves as an evil counterpart to the good St. Nick. He would think back over his misdeeds of past months — the days he had refused to clear the supper table, left his homework unfinished or pulled a girl’s hair. Besides visiting homes with St. Nicholas, the Krampus has for centuries run through village and town centers spreading pre-Christmas fear and chasing away evil spirits. That tradition dwindled across much of Bavaria during the 1960s and ’70s, as postmodern society moved away from its rural past. But with cultural homogenization spreading across an increasingly unified Europe, a new generation is bringing back the customs that defined their childhoods, and those of their parents and grandparents. A decade ago, Mr. Bierbaumer, 46, persuaded Munich authorities to stage an old-fashioned Krampuslauf: a spectacle in which the fearsome seasonal beasts run through rows of adorned wooden huts at the Bavarian capital’s oldest holiday market. He saw it as a way to ensure that future generations would share his childhood ritual, which takes place between late November and Dec. 23. At that point, similar beasts, known as Perchta, take over the fun until Epiphany. The Munich Krampuslauf celebrates the history of the custom, including the artistry of the hand-carved, hand-painted masks. Advocates of the ritual say reviving it is important because American Christmas customs, which they see as more commercialized, have made their way into the German holiday. Only old-fashioned Krampus, mixed with their cousins, the Perchta, are allowed to participate in the Munich runs, held on the second and third Sundays before Christmas. To join the run, they must be dressed in wooden masks with horns and goat or sheep pelts, and carry bells and switches — though only for show. Upholding the seasonal ritual is of “absolute importance,” said Günter Tschinder from Lavanttal in Austria’s Carinthia region. This just makes me happy. Also, “Old Fashioned Krampus and The Perchtas” will be the name of my Scorpions tribute band. Merry Christmas, everybody. “Go Tell It On The Mountain” is one of my favorite religious Christmas songs – it’s underrated and greatly underused. As for “Linus and Lucy”, it’s my considered opinion that it’s the best known jazz song in the world. Play just about any part of it to anyone, and they’ll know it. What are your favorites? Yes, it’s Christmas time again, and inspired in part by this Slate story on how bad Do They Know It’s Christmas? is, here’s a list of Christmas songs we, or at least I, could do without this year. Honestly, with the exception of “The Little Drummer Boy” (which I loathe), I don’t really dislike most of these songs so much as I’m tired of them. For truly awful Christmas music to wallow in, I recommend Popdose’s annual Mellowmas tradition, with a generous supply of alcohol to help you cope. Finally, as for Jingle Bells, I’m done with any version of it that doesn’t include at least two verses. I had a Chipmunks Christmas 45 RPM record as a kid that had three verses of “Jingle Bells” in it. That’s still the all-time champ as far as I know. (The Trinity Jazz Band version is a funky 7/4 time arrangement, so it gets a pass as well.) Feel free to use this post to vent your frustrations with whatever Christmas song you could do without. The good thing about drafting a couple of these in advance is I don’t get caught late in the week needing to put a post together for Saturday. The downside is that I might forget where I am alphabetically. Oopsie. Whether that addresses the concern or just avoids it probably depends on your opinion of the song. Me, I’ve always liked it. I’m a sucker for a good duet. I get why people have these issues with the song, but to me it’s in the ear of the listener and not endemic to the song itself. Listen to Colbie Caillat and Gavin McGraw’s playful and flirtatious version, or The Priestess and The Fool’s ethereal alternative version, or the Asylum Street Spankers’ version in which Wammo plays up the creepy cad factor for all it’s worth – it’s the mark of a good song to me that it can be interpreted in so many different ways. In the end, it’s a piece of art like any other, and you see in it what you want. I love this story by Lisa Gray. When Jim Fletcher asked his fiancee whether she’d mind if he grew a beard, Madge Boyer didn’t realize what she was getting into. That was in early 2007, not long after he’d played Santa for his civic club Christmas party. In the red suit, he wasn’t just a retired product quality engineer. He was the party’s focus, the object of children’s adoration and adult smiles. Madge, who’d played Mrs. Claus, had a good time, too. But she thought that was that. As his beard grew in, though, Jim began to wear red every day: Red suspenders, red sneakers, red shorts, polo shirts with candy-cane stripes, even a red business suit. He traded in the costume-shop Santa suit for tailor-made editions. His belt buckles said “SANTA.” He hand-carved an elaborate walking cane and, for formal occasions, a tall staff emblazoned with reindeer. When working in the yard, he’d add a red cap to his regular work clothes. If he had to drop by the hardware store, he’d shower first and change into an outfit worthy of his station. He studied “Behind the Red Suit,” a book about the business side of Santa-hood. At a Dallas seminar hosted by the International University of Santa Claus, he learned Santa history and lore, as well as the fine points of beard maintenance. He swore the Santa Claus oath, promising to use his powers to “create happiness, spread love and make fantasies come to life.” He printed business cards with a number for his “sleigh phone.” During the off-season, he kept his 100-year-old mahogany Santa throne by the living-room fireplace. But Jim was no longer just Jim; he’d become Santa Jim. Santa was part of the Jim Fletcher package. After the holidays, the Fletchers spend a surprising amount of time in the company of other Claus couples. 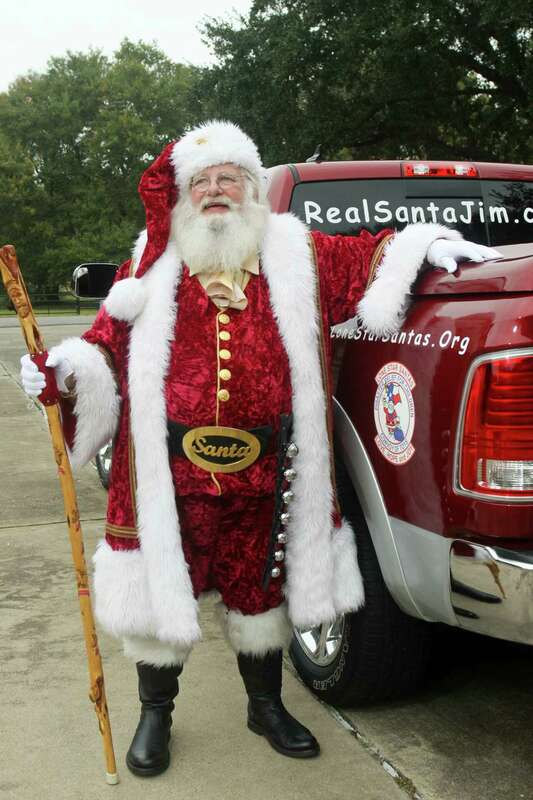 In Jim’s first year as a Santa, he helped launch Lone Star Santas, a fraternal organization open to Clauses, Mrs. Clauses, elves and reindeer herders. The first meeting, in Brenham, attracted about five Santas. Now, with roughly 120, it’s one of the biggest regional Santa groups in the country. This. That’s what it’s all about. It’s what Santa Claus stands for, not what he – or she – looks like. I could quote the whole thing, but I’ll hold back. Just go read it and feel good about the spirit of giving that makes Santa Claus what he is. Every year on Christmas Day, I link to my favorite Christmas story, which stars Mel Torme. Apparently, this story is so popular now that it gets ripped off a lot, which sure seems to be contrary to the Christmas spirit if you ask me. But let’s not worry about such things this morning. Merry Christmas to you and yours. May your days be merry and bright, and may the new year bring you all the joy you can handle. Tuesday video break: With how much care are your stockings hung? Christmas Eve, y’all. You know what that means. I’ll post the Mel Torme story tomorrow. Until then, Happy Christmas to all, and to all a good night. If it’s Christmas time, it must be time for a Pancho Claus story. He usually has black hair and a black beard, sometimes just a mustache. Like Santa, he wears a hat — though often it’s a sombrero. He dons a serape or a poncho and, in one case, a red and black zoot suit. And he makes his grand entrance on lowriders or Harleys or led by a pack of burros instead of eight reindeer. Amid all the talk about Santa Claus’ race, spawned by a Fox News commentator’s remarks that both Santa and Jesus were white, there is, in the Lone Star State, a Hispanic version of Santa in cities from the border to the plains — handing out gifts for low-income and at-risk children. Born from the Chicano civil rights movement, Pancho Claus is a mostly Texas thing, historians say, though there may be one somewhere in California. Lorenzo Cano, a Mexican-American studies scholar at the University of Houston, says Pancho was apparently conceived north of the border as Mexican-Americans looked to “build a place and a space for themselves” in the 1970s. His rise coincided with a growing interest in Mexican art, Cinco de Mayo, Mexican Independence Day and other cultural events. “We have kids that we ask, ‘Did Santa Claus come to see you?’ and they say, ‘No he didn’t. But Pancho Claus did,'” says Robert Narvaiz, vice commander for Lubbock’s American GI Forum and coordinator of that city’s Pancho project. Each city’s Pancho has a unique local flavor, but all share roots that set Pancho apart from Santa. Here’s a look at just a few. Oh, and Feliz Navidad, amigos. For God’s sake, don’t tell Megyn Kelly about this! I’ve blogged about Pancho Claus before – Houston’s version is played by Richard Reyes, whom you see in the photo above, but he’s far from the only one, and his look as Pancho Claus is unique to him. I love reading about Pancho Claus, not just because of the good works the various Panchos do, but also because of the beautiful way he represents the utility and versatility of the Santa Claus story. There are as many variations on Pancho Claus as there are on Santa Claus/Father Christmas, and it always amazes me how adaptable that legend is. It’s true that there are some people whose small minds can’t handle anything that doesn’t resemble themselves or the stories they grew up with, but those people will always be with us in one form or another. No reason to let them detract from the wonder of Pancho Claus. Feliz Navidad, y’all. Let your Christmas tree do some good after you get rid of it. When that Christmas tree comes down this year, take a moment to imagine its next incarnation: Chipped up and mixed into soil, it might soon secure new grasses along some South Texas highway or sustain vegetable starts in someone’s garden. Adding weathered plant material back into the soil is becoming the norm for a growing number of people who are purchasing and using compost. Two decades ago Houston offered only a couple places to buy it; now there are more than 60. Beyond buying, more people are learning how to make compost themselves from clipped grass and wilted vegetables. “We are in a high growth mode and poised to steamroll,” said Michael Virga, executive director of the U.S. Compost Council. It plans to debut a campaign this spring with a message aimed at landscapers, green builders and the public about poor soil quality and the importance of recycling food. “Compost Camp” is offered by the State of Texas Alliance for Recycling. Urban Harvest, the Houston gardening nonprofit, offers classes in compost and soil. Composting has grown significantly in Texas for a different reason, and it has a lot to do with the Texas Department of Transportation. It has become, it believes, the single largest purchaser of compost in the country. In 1985, landscape architect Barrie Cogburn tried to help TxDOT determine why its freshly graded slopes so frequently slumped away in the rain, taking with them the department’s expensive plantings. Cogburn noticed that new topsoil brought in by subcontractors was often little more than finely ground rock. Cogburn and Scott McCoy of the Texas Commission on Environmental Quality teamed up in an experiment adding compost to the transportation department’s soil. They also added dairy manure that was piling up in Bosque County, polluting water all the way downstream to Waco. The results were favorable: TxDOT embankments started staying in place. And the organic material retained water, so the department had to irrigate less. The practice is now widespread. 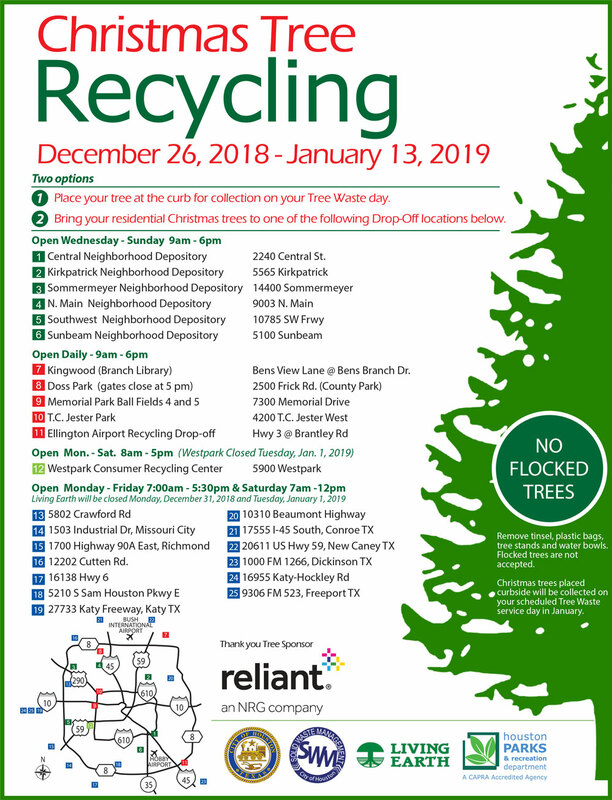 To ensure that your tree is part of the circle of life and not needlessly taking up space in a landfill, you have to take it to a recycling center, or if you have city of Houston trash service you can leave it by your curb on a tree waste day. You can find a list of recycling centers here, and the Chron has a handy map here. 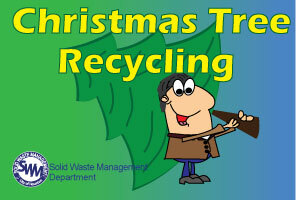 Recycling centers will take trees through January 7. This is a no-brainer, so make sure you take advantage. If you’ve ever lived in San Antonio, you are undoubtedly familiar with the Elf Louise Christmas Project. I’m sad to say that “Elf” Louise Locker has suffered a heart attack, but thankfully appears to be recovering nicely. The woman behind one of San Antonio’s most prolific Christmas-based charities, Louise Locker, had a heart attack Sunday evening, according to a posting on her facebook page by talk show host Chris Duel. The Elf Louise Christmas Project is a volunteer based organization that works to deliver gifts to children who would otherwise go without. Locker started the project in 1969 as a student at Trinity University, when she collected gifts for children in 13 families. 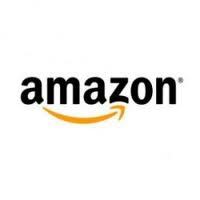 The organization now has close to 4,500 volunteers, an annual budget of more than $300,000 and distributes some 60,000 gifts, according to its website. My very best wishes for a full and fast recovery, Elf Louise, and a Merry Christmas to you and your family.